for me. The book obsession continued through to college where I waited in lines for the latest released. The movies started my first year of high school and continued till I graduated college, helping me transition out of my childhood and into adulthood. Then as I drank on the porches in the ghetto at the University of Dayton I discussed the upcoming Wizarding World of Harry Potter coming to Islands of Adventure in 2010. JK Rowling created a world where readers wanted to live in the lives of the characters. 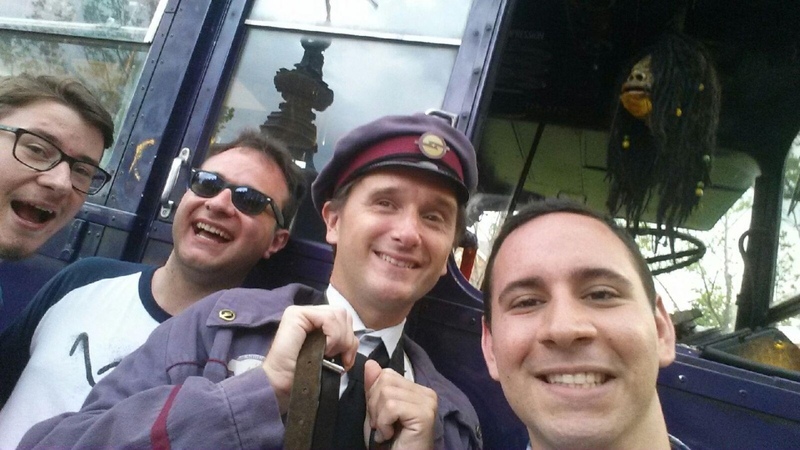 She tethered the real London locations to this new world in extraordinary ways with things such as Platform 9 3/4, Diagon Alley, and the Ford Anglia. 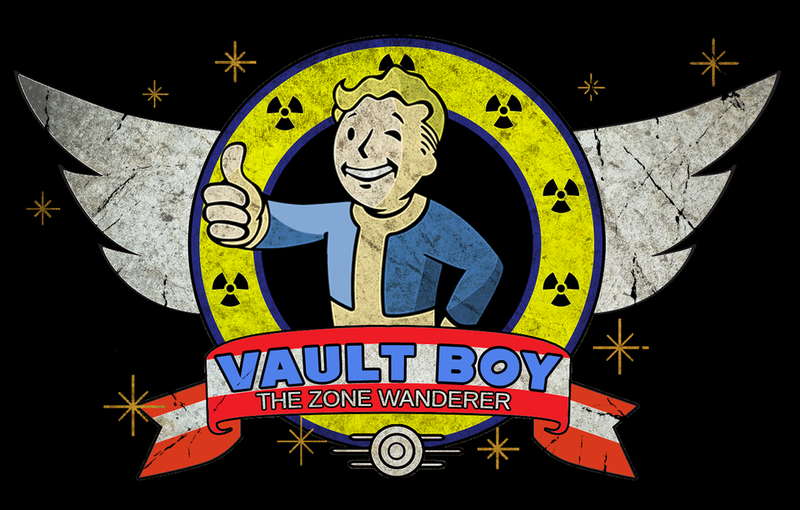 These locations were (at least initially) warm and welcoming with a hint of mystery and danger. The vaults of Gringotts are a fantastic example, here goblins control the bank and the most secure vaults are guarded by a tortured dragon. 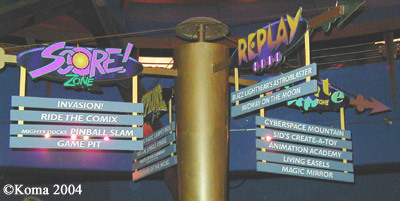 And finally the plot of books revolved around a fantastical version of growing up in the 1990s and 2000s. 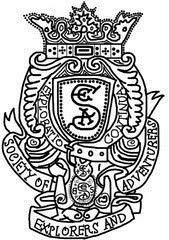 The characters dealt with studies, sports, rivalries, other schools, and romantic entanglements, but of the most magical sort. 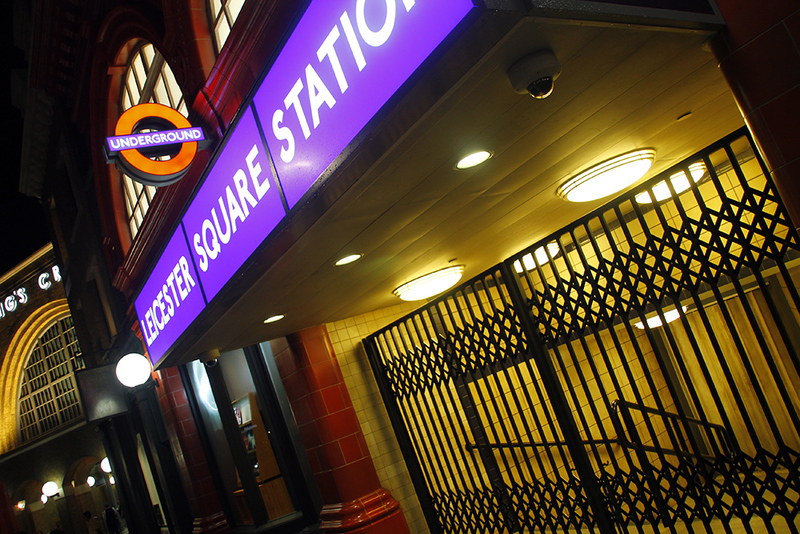 JK Rowling left readers of the books wanting to visit the locations in real life. The wish was granted when The Wizarding World of Harry Potter- Hogsmeade opened in 2010 to unprecedented crowds. 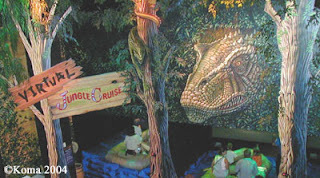 Guests engulfed the resort; Islands of Adventure was turned into a massive queue for the land while guests waited all through CityWalk in a massive queue. An operations nightmare quickly turned into the golden goose as the profits from sales of Butterbeer reportedly paid off the expansion in months. I first visited Hogsmeade in 2012 after a disastrous stint in my first job out of college. I was depressed, I was confused, and I was a huge doubter in what could be delivered by Universal. While I was relieved seeing videos of the land on YouTube, it wasn't till I visited that I became a believer. I have memories of my first Forbidden Journey ride, Olivander's visit, and chilling at the giant round table in Hog's Head drinking a beer with a friend. 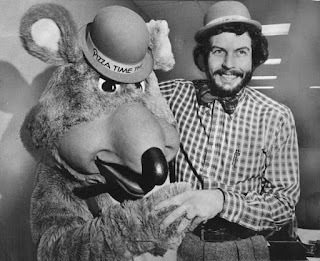 Every visit to the resort since opening, I've always hopped on over visit for a few hours. Based on the success of Hogsmeade, Warner Brothers and Universal Creative started work on creating concepts for a Diagon Alley at the parks. JK Rowling demanded a physical separation of the locations, just like in the books and movies. 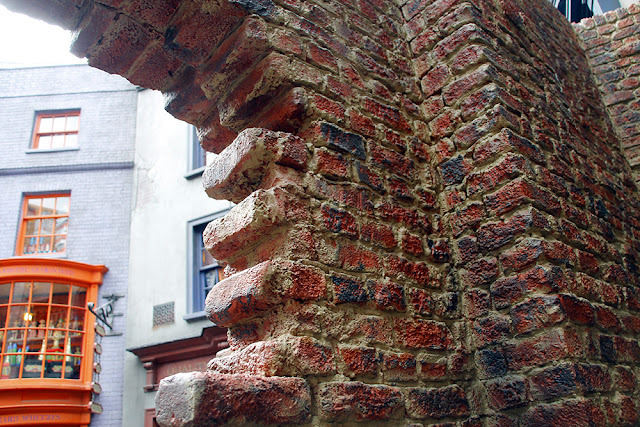 Diagon Alley was then designed to fit into the aging, and expensive to run, Amity Island and Jaws attraction plot. 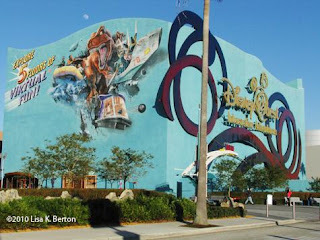 On January 2, 2012 Jaws closed forever. middle of a large green garden. Behind it Wyndham's Theatre and Leicester Station false facades simulate a cramped, overdeveloped city. As a nod to what is hidden, The Knight Bus conductor and shrunken head, as featured in Prisoner of Azkaban, greet guests outside the bus for a comedic banter and a photo op. 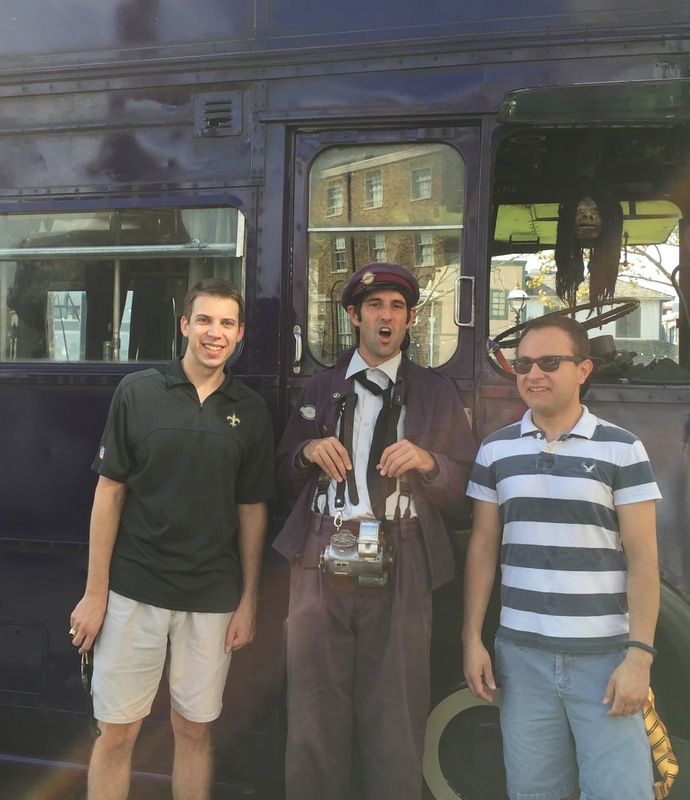 When I visited with Mike the shrunken head said I had to be an escapee from Azkaban (and my lack of answers I was "a pain in the Azkaban"). 12 Grimmauld place’s dark brickwork and sagging gutters stick out among the pristine residential block, and Kreetcher frequently sneers out the window at the passing mud-bloods. A musical shop is selling vinyl records of “Bow Legged Women” (Jaws reference to the prior attraction in that location) and “Joe Sez No” (referring to JK Rowling and her final approval of all decisions). Next door a book store featuring The Wind and the Willows and 20,000 Leagues Under the Sea (jabs at Disney) complete the facade into Diagon Alley. Kings Cross station completes the location and is the entry way to the Hogwarts Express. More about that later. 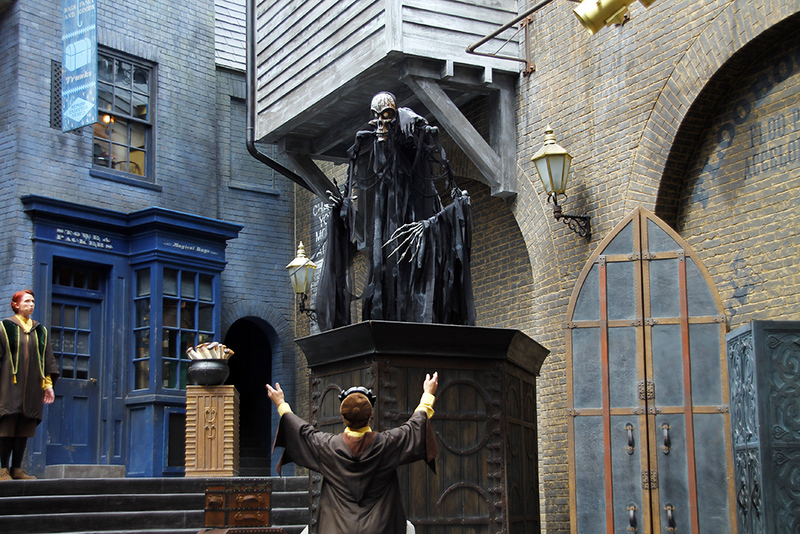 Diagon Alley features four zones: Diagon Alley proper, Carket Market, Horizont Alley, and Knockturn Alley. Diagon Alley opens up just like walking through the Disneyland portal, directing your view down a forced perspective street towards the Gringotts Bank facade. Diagon Alley, the street, has a slight gradient which combines with the overhead train tracks to create a perfect, picturesque view that makes the street look twice as long. Even above the tracks is a Stop/Go light supposed to be only visible to muggle drivers of trains, a fantastic random detail. I have never been as dumb-struck as the first time I entered both during the day and at night. Universal Creative has knocked it out of the park with this reveal. Diagon Alley is home to the Leaky Cauldron, Madam Malken’s Wizards Robes for All Occasions, Wizard Weasley's Wizzes, Quality Quddich Supplies, Eeylops Owl Emporium, and Ollivander’s. 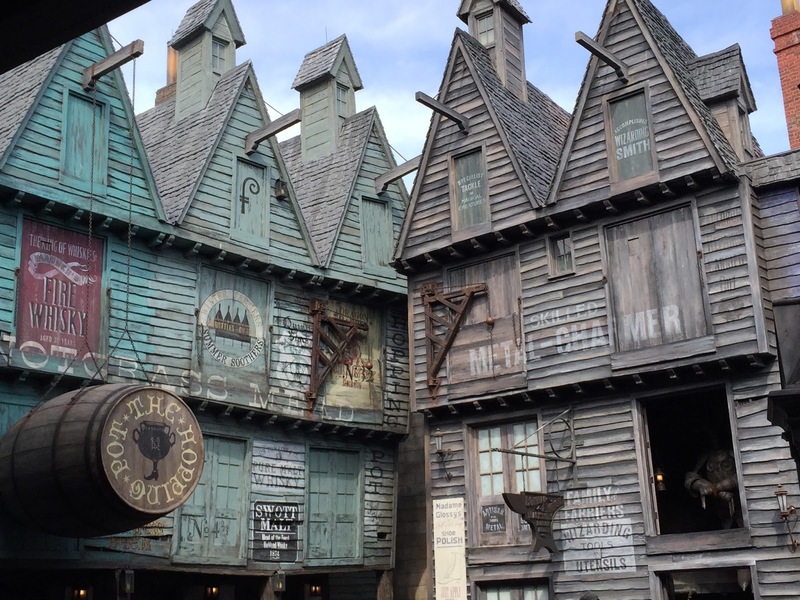 Leaky Cauldron offers a more spacious version of Three Broomsticks. While offering a similar style of food the food is more metropolitan over the rustic Three Broomsticks. You'll find sausages and puddings instead of roasted corn on the cob and roast chickens. I prefer the more intimate nature of Three Broomsticks over the cavern of Leaky Cauldron. But don't worry, the awesome Fish & Chips are at both locations. Olivander's is the expanded, full scale version of the Hogsmeade location. Instead of a cramped queue in the elements, here an interior queue and three 'theaters' reduce and make the wait more pleasant. The queue has several stories of stacked wand boxes gathering dust, waiting for the correct witch or wizard to come. The show itself is identical to the one in Hogsmeade, except with the addition of additional sound proofing and female wand keepers. A nice touch are the books the wand keepers record all the wand pairings in. 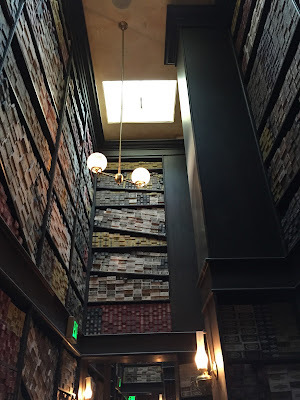 Olivander's is a must see for me several times a trip. Wizard Weasley's is a high energy, smaller shop with gags and candies offered in the movies. Here you can buy your Nosebleed Nougats or more muggle toys like egg and spoon races. The biggest disappointment is that you cannot buy the unicycling Umbridge on the wire, only one that runs on a desk. The cutest thing in Diagon Alley is the Pigmy Puff naming ceremony, where an adoptive parent celebrates the naming of their new Pigmy Puff. News has come out that Shutterbuttons, located adjacent but in Carket Market, will be shut down and replaced with an expansion to Weasley's. Madam Malken's offers robes and dress items for the Hogwarts houses. Here you can pick up robes, shirts, ties, shorts, t-shirts, wallets, and more. Two cool features in Malken's are a mirror that judges your fashion sense and a dress that is enchanted to display animated patterns. Next door is Eeylops, a disappointing shell of a store set up as a queue for Malken's during busier times of the year. An odd location, it would make more sense to reconfigure the line at Fortescue's. Quality Quiddich Supplies is a slight let down, offering more Hogwarts house shirts than items from known Quiddich teams. A recent trip offered shirts from other Quiddich teams, but the selection still remains too similar to what Madam Malken's offers. I want to see more t shirts, uniforms, signs, flags, and merch from the professional teams in the Wizarding World. 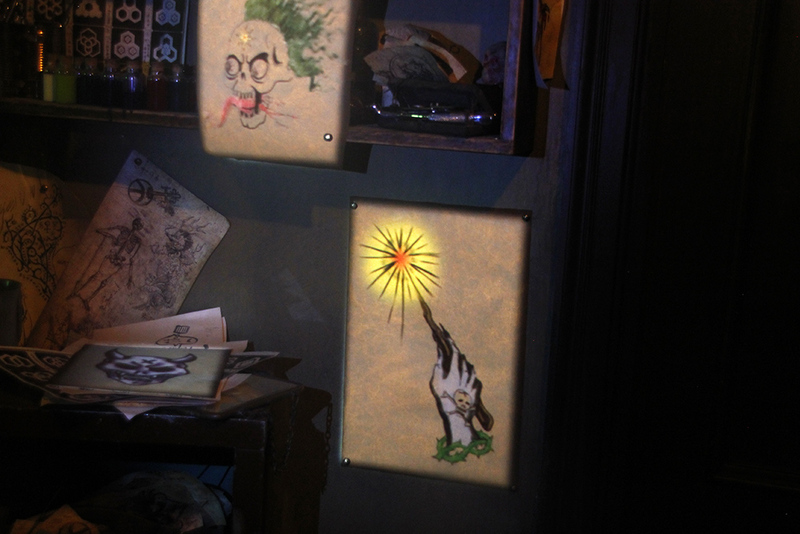 Universal decided to only offer one official interactive wand spot on Diagon Alley due to traffic concerns. At Weasley's you can flush a toilet for You-Know-Poo, but down the street are several hidden effects, such as wafting dragon dung. More interesting and frequent windows are offered on the other streets. 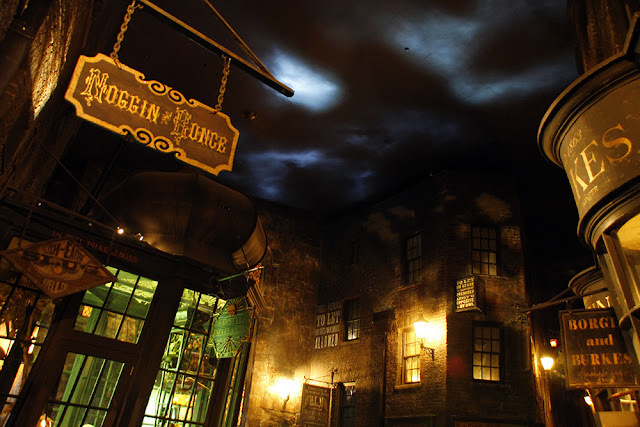 Horizont Alley is the main spur-street to Diagon, offering Florean Fortescue’s, The Fountain of Fair Fortune, Magical Menagerie the only restrooms in Diagon Alley, additional interactive windows, and the entrance to Gringotts Bank. Unlike Diagon Alley, Horizont features many large windows placed on the second floors, giving an appearance of being more residential and lived in. A stairway next to Gringotts leads up several flights to facades suggesting more beyond the barricade. Chandeliers are hung in a large picture window, which react to the weather spells cast in the area. Near the restrooms an interactive umbrella is held over the street and with the right spell one can make it rain (which isn't so miraculous in Florida when you think about it). Florean Fortescue's offers a dozen ice cream choices from Butterbeer to Chocolate Chili. The most disappointing option, in our opinion, is the Butterbeer. It's weaker and more vanilla like than we expected. Sean likes the Strawberry and Peanut Butter, while I love the clotted cream and sticky toffy pudding. Fortescue's always has a huge line, and due to poor placement, it's all outdoors. Magical Menagerie services all our magical animal needs in Diagon Alley. Here you can pick up your Pigmy Puff, Phoenix, Owl, or Fang plush figure. A covered cage above the guests show a group of rats are attempting to escape. Outside, a large snake in a back window speaks parseltounge . While a well done store, it doesn't speak to my current interests, but it is a hit with small kids. The Fountain of Fair Fortune, named after the short story by the fictitious Beedle the Bard, is an indoor bar serving all the Butterbeer varieties, several beer options, and exclusive to Diagon Alley beers: Wizards Brew and Dragon Scale. Wizards Brew is a very drinkable stout, with large chocolate notes without having the "I just ate a loaf of bread" heaviness. I prefer Dragon Scale, a pale lager, which resembles a cross between a crisp lager and a light pale ale like Sierra Nevada. This location is the least busy out of all the drink locations and is a good bet when Leaky Cauldron and Hopping Pot are busy. Carket Market is a covered, open air market to the north east of Diagon Alley. 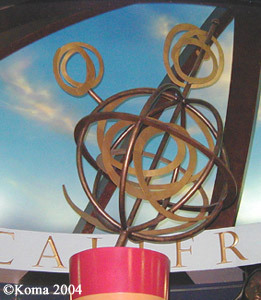 Designed to offer protection from the elements, the roof is improperly designed and allows water in at several points. For such a well designed land, this is a massive oversight and one of the few complaints I have with the land. If properly designed, this area could have been a perfect location during downpours. Even the stage isn't protected from the elements. To the north, The Hopping Pot is the outdoor bar, offering a similar selection to The Fountain of Fair Fortune. Here you can pick up Butterbeer, several cider options, and the exclusive beers Wizards Brew and Dragon Scale. Newly offered is Fire Whisky, a smooth but flavorful cinnamon whisky. Much finer and higher quality than its name-brank relative Fireball, the whisky is offered in shot form or mixed with other drink options. Unlike Fountain of Fair Fortune, the bar features several picnic benches to sit on while drinking. Between Hopping Pot and Gringotts Money Exchange is a large elevated stage set to look like a sales and storage area for Carket. Here Celestina Warbeck and Tales of Beedle the Bard perform. Celestina Warbeck and the Bashees is a 1930s big band swing live song performance written by Broadway composers Alan Zachary and Michael Weiner. Celestina is joined by the Bashees, a three piece back up. The show Broadway-style show features hits as 'You Stole My Cauldron', Puddlmier United’s Quiddich anthem, and 'You Stole My Cauldron But You Can't Have My Heart'. During 'You Charmed the Heart Right Out of Me', Celestina brings someone she needs, more than a Butterbeer, on stage to dance and be the direction of her affection for the song. The performance is high energy, swing jazz style of songs that muggles will tap their toes while those enrolled in Hogwarts will understand all the lyrics. 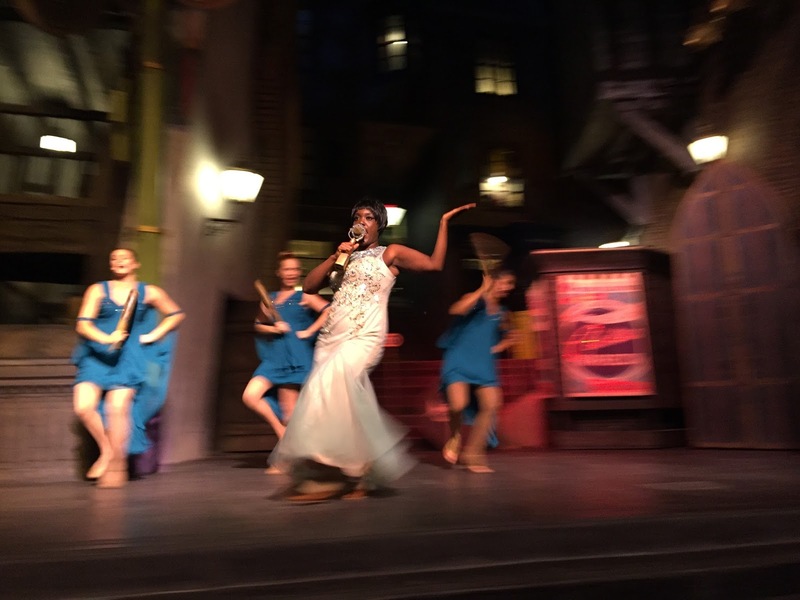 Celestina Warbeck is one of the best shows of its size in Orlando. The Wizarding Academy of Dramatic Arts (WADA) is an ancillary artistic school to Hogwarts' school of witchcraft and wizardry in the Wizarding World. In Diagon Alley a roaming group of WADA street performers reenact the Tales of Beedle the Bard, the wizarding world's Aesop. Using the same market stage as Celestina, They use special hidden effects and props hidden in the set pieces to draw guests into the tales. Puppets designed by Michael Curry resemble those used in traditional Japanese theater, where the performer and puppet are visible yet both disappear into one character. The characters in the tales randomly perform one of two morality plays: a cautionary tale of cheating death or the importance of overcoming ones own struggles no matter ones skill. 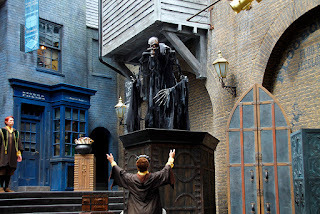 I love Celestina Warbeck but Beedle the Bard is the best performance in Diagon Alley. In Carket are three wand locations at the armory, drinking fountain, Wiseacre's, and one hidden. At the armory are two stations, one for activating a flame stoker and one that assembles a broken piece of armor, both cool physical effects. A double drinking fountain, located near the Hopping Pot, is only activated using a spell. Be careful, the water fountain doesn't alway agree with sending out water to just that casting the spell. One of the Wiseacre's display windows has a telescope that lights up with constellations with the correct spell. 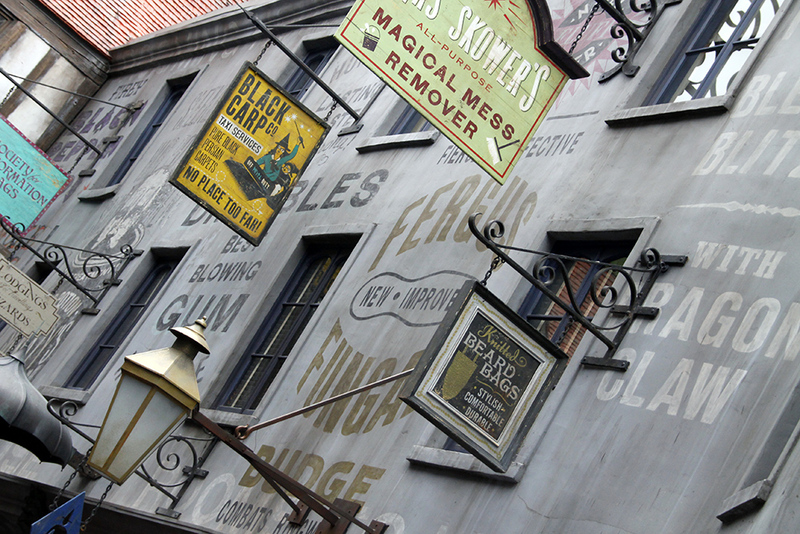 Carket Market's wand locations are the most popular ones in Diagon Alley and are best hit early in the morning. near Leaky Cauldron and another near the restrooms in Horizont Alley. Four separate 'compartments' help diffuse light and create darkness. Two compartments are initial entrances, another is the main courtyard, and the last is for Borgin and Burkes retail shop. The real strengths of Universal's design team comes into play here. The posters for dark and evil members of society are hung on the walls, laughing and taunting those who walk by. Tattoos animate in a parlor while dingy clouds pass overhead. Knockturn's wand stations are some of the least attended in Diagon Alley. One whole room is dedicated to two effects; a speak easy like door you must enchant to open and a caged canary in a window you temporarily curse. In the main courtyard a stylized house elf is inside a chimney and a well placed incendio spell animates the elf to climb up as fire chases him below. Next door is a doctor's shop where you can maneuver a skeleton by moving waving limbs. 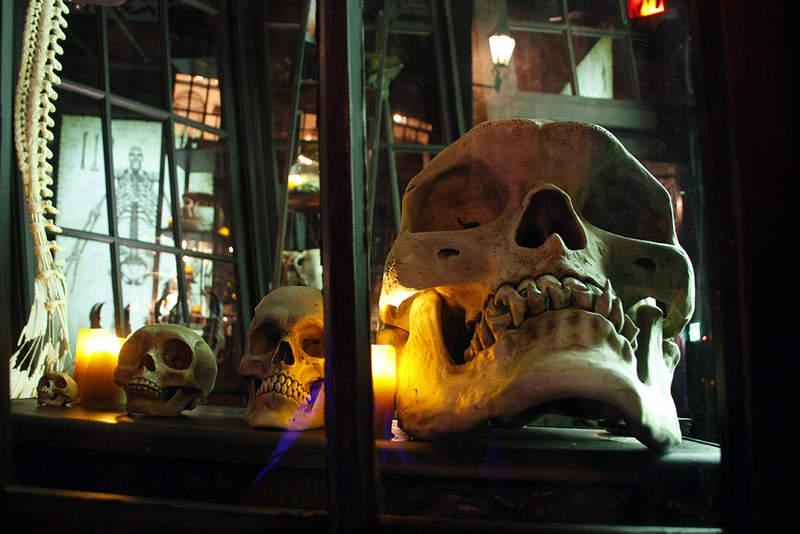 Knockturn is the location of Borgin and Burkes, the shop for all your strong magic needs. The first employer of Tom Riddle, Borgin and Burkes sells dark magic supplies, cursed items, and magical antiques such as the vanishing cabinet or see the hand that grabs Harry in Chamber of Secrets. If you want to pick up deathly hallow or death eater merchandise, this is the location to buy it. You can buy mugs with the deathly hollows logo, Bellatrix Lestrange t-shirts, and more. The shop is dark, errie, and imposing by design; here you can feel the real brunt of bloodlines and social conformity of older generations of wizards and witches. 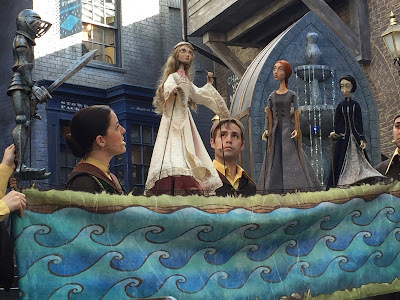 Diagon Alley creates a location where all fans of the Wizarding World want to be. A real inner city is recreated both through visual illusion of depth and physical immersive locations. There has been nowhere else in theme parks that has caught my imagination as much as Diagon Alley. Photos by Parkscope Joe and OrlandoUnited.com. Thanks to Brian and HTF for use of photos from OrlandoUnited.com. Joe, Nick, and Sean are joined by Jon Fu from InsideUniversal.net to discuss banning selfie sticks, Fast & Furious Supercharged, the Universal Studios Hollywood Nighttime Tram Tour, capacity and parking woes at Hollywood, Disneyland pushing for admissions tax exemption in exchange for $1bn in expansion, Disney's Hollywood Studios rumors, Twister permits, and more. Hey hey hey hey! 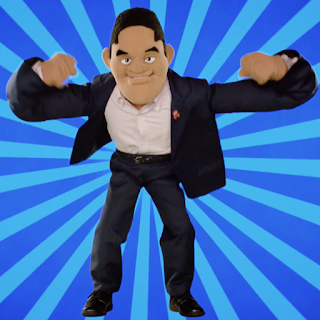 Hey hey hey hey! Good news everyone! Yesterday, Universal applied for an "Interior Demolition" permit for Project 727. Project 727 is strongly believed to be the replacement for Twister: Ride it Out. 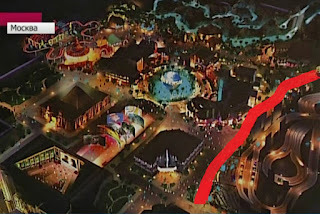 A Tonight Show attraction is the favorite to replace to Twister, and we expect a fancy new New York facade package to come to the area. The end is nigh for Ol' Twister, so we suggest getting your Paxton fill as soon as possible. Credit to NJBrandon on Orlando United forums for the permit find. 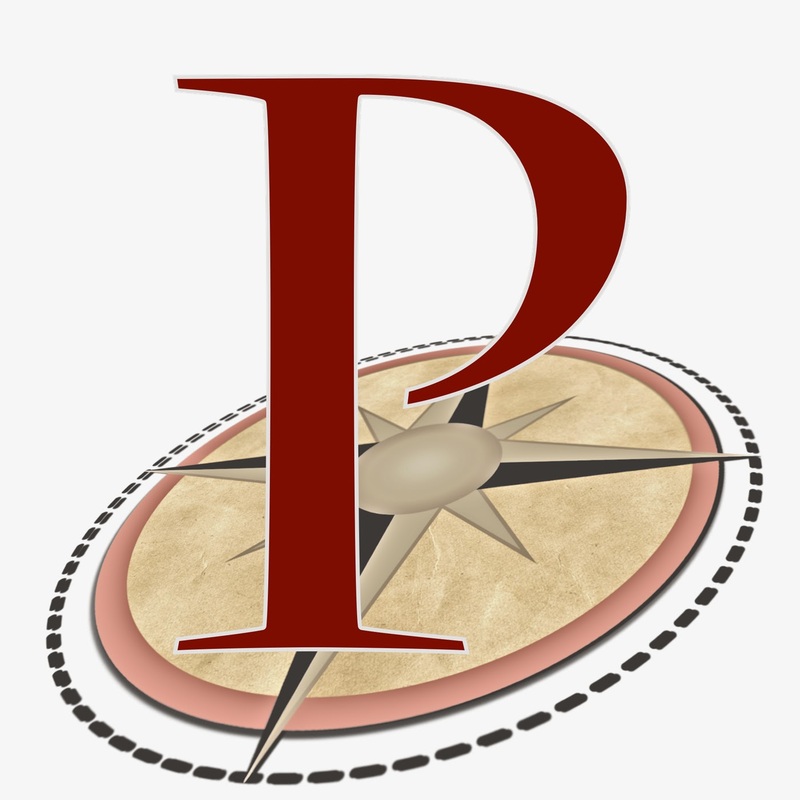 As always, please follow @Parkscope on twitter for the latest updates. To catch up on Project 727 and the Tonight Show attraction, check out Orlando United forums. Today on the Universal Orlando Resort Blog it was announced Wet n Wild will be closing December 31st, 2016. Opened in 1977, Wet n Wild was one of the first water parks in the country. The closure is not unexpected after the announcement of Volcano Bay last month. No information is available about jobs transferring to Volcano Bay.